Leading Wholesale Trader of red count down timer from Pune. We offer an authentic range of Two Half Digit Count Down Timer comprising of digits indicating minute and seconds. It is available in red colour only. 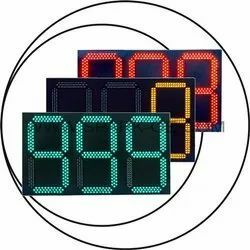 Our offered countdown timer are proven highly useful for pedestrian as they can act in accordance with the given red and green signal. It shows remaining time to close the existing signal Red /Amber/ Green respectively. To provide information to pedestrians about how much time is left to cross the street at signalised intersections. NOTE: Given Price for 2 Digit Count Dawn Timer. Looking for TRAFFIC COUNT DOWN TIMER ?